Something really fun is coming next week! Meredith has invited Jacey, Debbie, and myself to participate in the Holiday Craft Bash with her and I'm getting so excited about all the projects we are going to share. Each Monday thru Friday for the next few weeks, a different one of us will be sharing a Christmas project and how-to. I love the idea of this set-up because we all four have such different strengths and styles. Jacey is just brilliant at putting together colors and fabrics, Meredith does amazing embroidery and handwork, and Debbie does such modern appliqué and piecing. Should be fun. And we are starting early so that Christmas doesn't sneak up on us before we have a chance to make some new decs. Happens to me EVERY YEAR. So you will get blasted with holiday inspiration thru the week, and then on Fridays we will have prizes for those of you who sew along with any of the projects. Really good fabrics and stuff from Sewn Studio, Stash Fabrics and more. 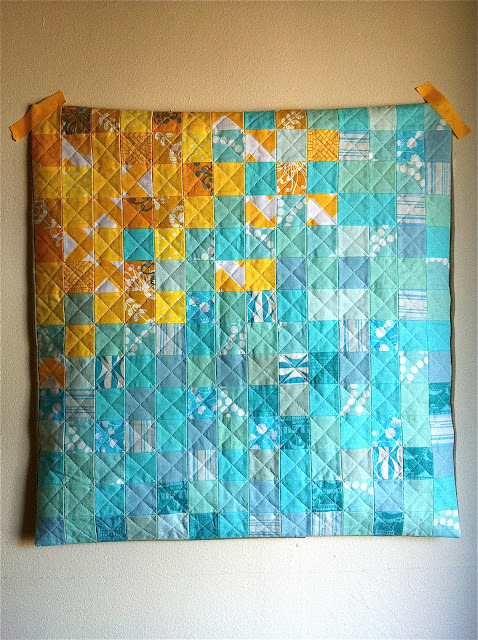 All you have to do is add your work to the Holiday Craft Bash flickr group to be entered to win. Next Monday I'll be kicking off with my stocking project. Get. Excited. And before I spend the rest of the week sharing clothes for KCWC, I wanted to blog about this pillow I've been meaning to share forever. You may remember a while back I had some fun with a spammer and a comment contest. Pretty sure the spammer didn't actually see the comments, but I said that whoever wrote my favorite would get a custom pillow cover made by me. The very talented Cindy of Siestas and Sewing wrote my favorite comment and she asked for chilled out blues to match her home's beachy vibes. She also said her yellow kitchen was visible from the living room, so I threw the yellows in too. Totally sunny and beachy. My couch pillows are a little smaller than Cindy's, so the pillow looks slouchy, but I think it filled out well for her. 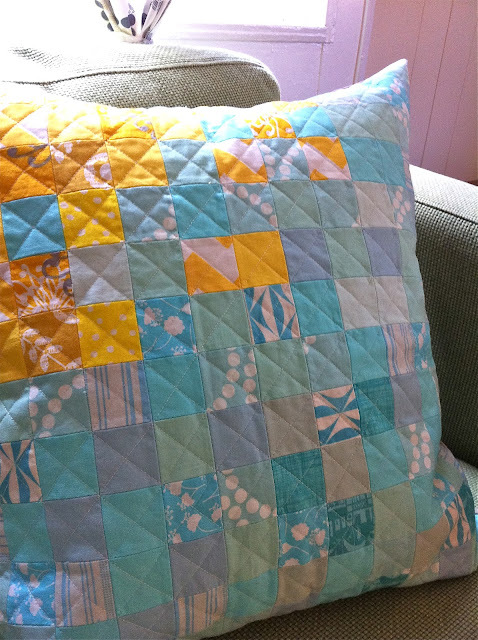 I used all scraps and fusible quilter's grid to get all those seams matching up exactly right. I love that stuff, because my seams would never look that good without it. Maybe I'll try to work it into one of my holiday tutorials for you? Ok, I really have to get sewing on those clothes. I have no kids for the week, no husband for the night, no excuses! I am excited and I love this pillow cover! such a cute pillow! and i have no idea how quilter's grid works, so yes please to a tutorial! I can't wait to see what you dream up for the HCB :) Love that pillow! 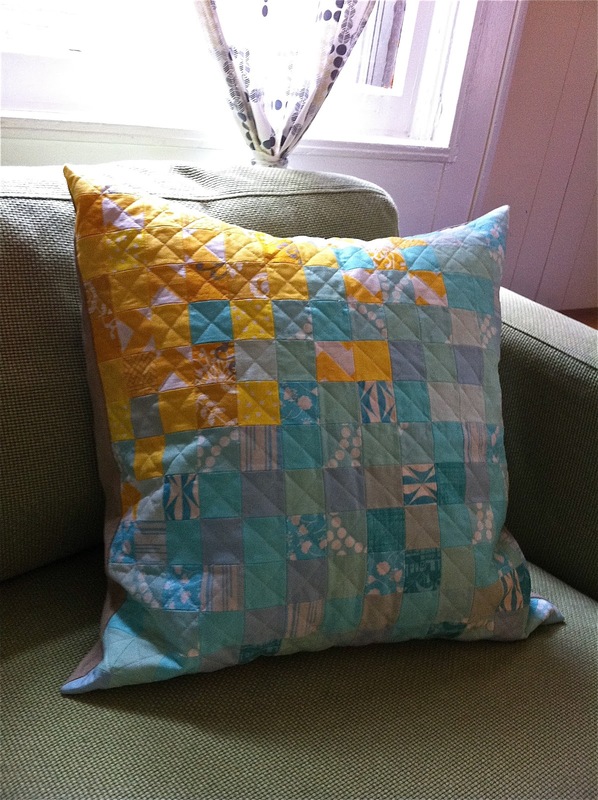 I've never tried quilter's grid, hmmm. Tutorial please! (in case I ever get around to attempting a similar look for the other pillows on the couch) We love the pillow, Jessica. Thanks Again! I LOVE - I mean, LOVE LOVE LOVE that pillow. It is phenomenal and it's things like this that make me believe you're a total genius. If you are ever trying to think of something to make for me, this is it. Thanks.